282 pages | 6 B/W Illus. This book engages with the thorny question of global urban political agency. It critically assesses the now popular statement that in the context of paralysed and failing nation state governments, cities can and will provide leadership in addressing global challenges. Cities can act politically on the global scale, but the analysis of global urban political agency needs to be firmly embedded in the field of urban studies. Collectively, the chapters in this volume contextualize urban agency in time and space and pluralize it by looking at how urban agency is nurtured through coalitions between a wide range of public and private actors. 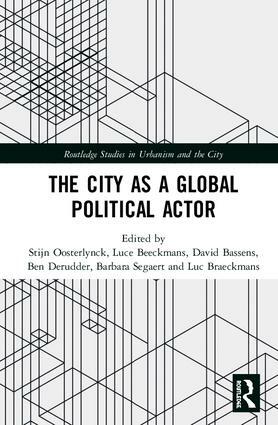 The authors develop and critically assess the conceptual underpinnings of the notion of global urban political agency from a variety of theoretical and disciplinary perspectives. The second part contains several (theoretically informed) empirical analyses of global urban political agency in cities around the globe. This book geographically expands analysis by looking beyond global cities in diverse contexts. It is highly recommended reading for scholars in the fields of international relations and urban studies who are looking for an interdisciplinary and empirically grounded understanding of global urban political agency, in a diversity of contexts and a plurality of forms. Stijn Oosterlynck is Associate Professor in Urban Sociology at the University of Antwerp, Sociology department. Luce Beeckmans is a full-time post-doctoral researcher at the Department of Architecture & Urban Planning of Ghent University, Belgium. David Bassens is Assistant Professor of Economic Geography at the Vrije Universiteit Brussels, where he is Associate Director of Cosmopolis: Centre for Urban Research. Ben Derudder is Professor of Human Geography at Ghent University’s Department of Geography, and an Associate Director of the Globalization and World Cities (GaWC) research network. Barbara Segaert is a scientific coordinator at the University Centre Saint-Ignatius Antwerp (UCSIA), where she develops academic programmes on various topics of contemporary relevance to society. Luc Braeckmans is Director of Academic Affairs of the University Centre Saint-Ignatius Antwerp (UCSIA). He is professor in the Department of Philosophy at the University of Antwerp, where he is also chair of the Centre for Andragogy.